Useful if you can't get barrels (Used in the Permachar Kitchen Garden (PKG). The PKG was a prototype for this design. Imagine the half barrels as swales above the ground. Dig the swales slightly across contour. Optional biochar layer right at the bottom of the swale (used in the PKG barrels). Water collects in the swale base during rainfall and is stored in the Permafert/biochar layers. 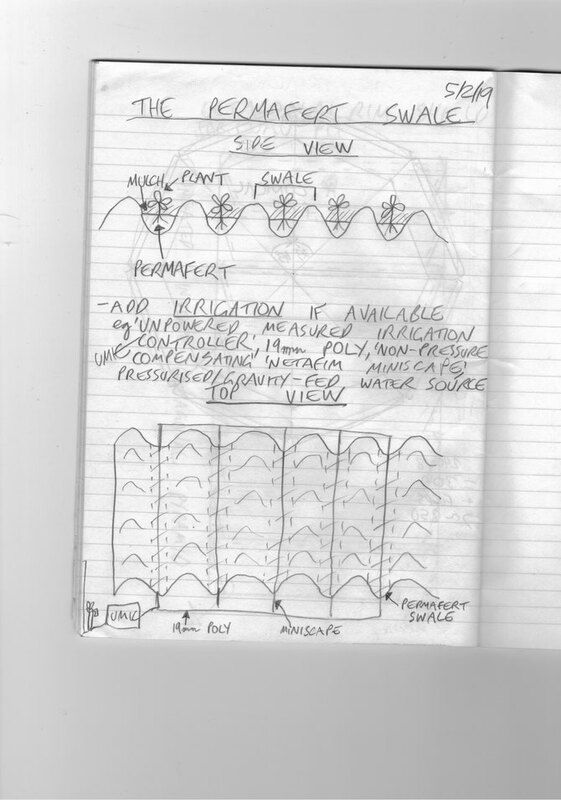 Irrigation (optional) tops up the water in the Permafert/biochar layers. 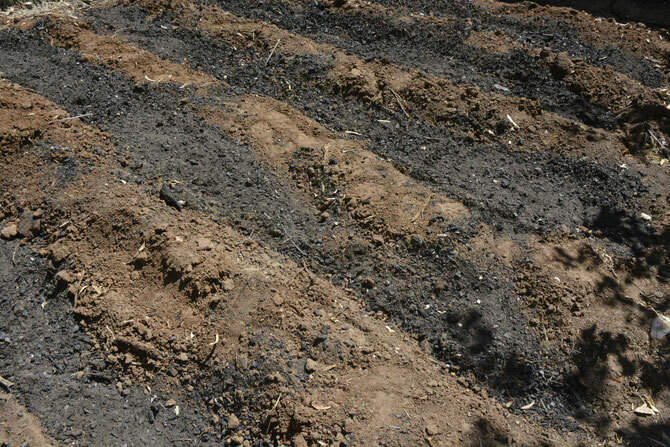 The biochar (found in the base layer and Permafert) adsorbs water and slowly releases it for the plants and soil biota during drier periods. This was dug in with a mattock and shovel after rain. If there is no water source accessible, you could increase the depth of the trenches after subsequent rainfall events. I got impatient and watered in the trenches from a watering hose. The trenches, when finished, should be about a foot deep. 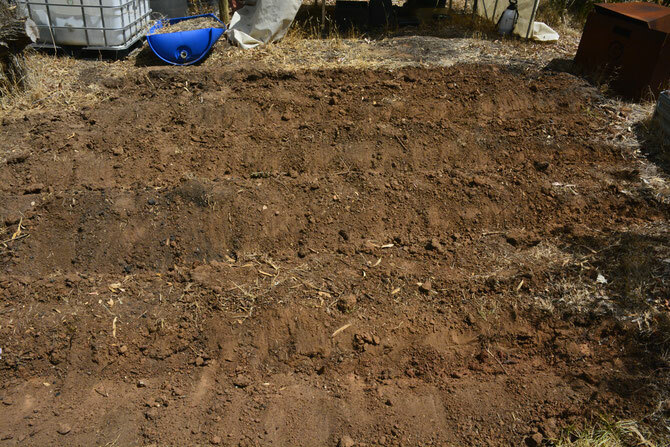 This will be my new veggie patch which will supplement the herbs grown in the PKG. I had enough biochar from last season to build biochar aquifers in 2 of the swales which will be topped up with TPM. I can then compare plant growth in these 2 swales with the remaining swales without biochar aquifers and just TPM contents. The Permafert mix from the old middens was used here in TPS prototype. Future Permafert swales will use the Permafert mix from the new middens and Permafert slurry once I get vermicomposting and compost tea'ing. The swales were 'watered in' to kickstart the soil food web and remove any air gaps in the Permafert structure.